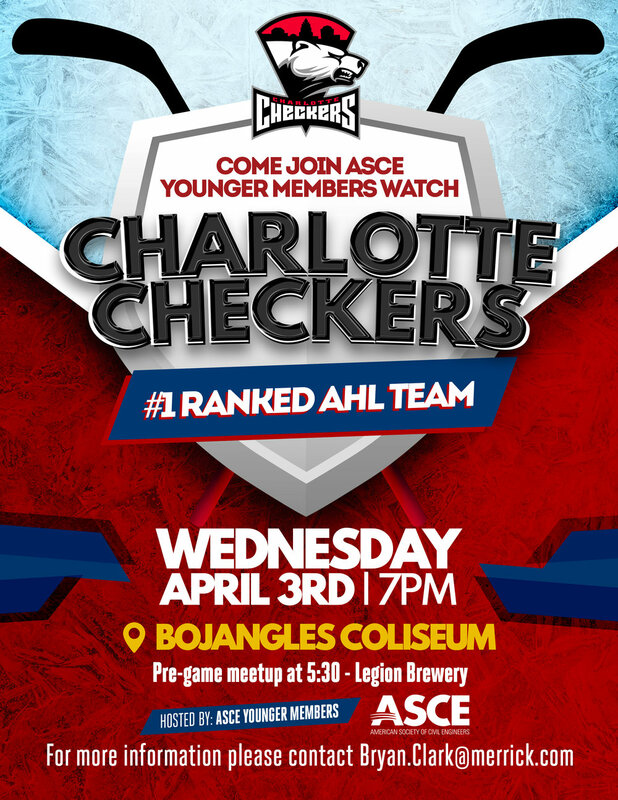 Please join our ASCE Southern Branch Younger Members on Wednesday, April 3rd for Happy Hour at Legion Brewery at 5:30 PM followed by a hockey game at the Bojangles Coliseum to watch our top ranked Charlotte Checkers play the Lehigh Valley Phantoms. Please email questions and RSVP for tickets to Bryan.Clark@merrick.com. Please join us for a our October meeting on Thursday, October 18th, 2018. Contact Alex Robinson at arobinson@fandr.com for more information. Please join us for a our September meeting on Thursday, September 27th, 2018. Contact Alex Robinson at arobinson@fandr.com for more information. Please join us for our March Meeting. This will be a lunch meeting at Dilworth Neighborhood Grille on Wednesday, March 21, 2018, with registration/socialization beginning at 11:30 am. Prior joining Sugar Creek Construction Jeff was the Highways Project Manager on the P3 Midtown Tunnel project in Hampton Roads Virginia. Other notable projects that he has worked on are Woodrow Wilson Bridge project in Northern Virginia, Ben Sawyer Bridge Replacement, and Cooper River Bridge in Charleston SC. Jeff received his engineering degree from The Citadel in Charleston SC and carries a professional engineer license in North Carolina, South Carolina, and Virginia. PayPal: For member registration, click here. For non-member registration, click here. PayPal payment alone does not guarantee registration for this event. Please RSVP to let us know in advance if you can attend the meeting by clicking the RSVP link presented in this e-mail. Please select either the member or non-member registration price by clicking on one of the two links above. The link will direct you to a payment page, at which time please select the number of registrations you would like to pay for (if you are registering more than one person). Then, either log in with your PayPal account to check out, or click on the “Don’t have a PayPal account” tab to open a credit card payment window. Once your payment information is entered, on the next screen please indicate that you would like to include specific instructions for your purchase and include the names of the people you are registering. This will ensure that we have an attendance list of everyone planning to attend. Please note – refunds will not be available to anyone that does not attend the meeting and does not request a refund at least 24 hours before the meeting date. Please contact our Treasurer, Robert Price rprice@summit-companies.com with any questions regarding paying for your registration via PayPal. Please join us for our July Meeting. This will be a lunch meeting at Dilworth Neighborhood Grille on Thursday July 27, 2017, with registration/socialization beginning at 11:30 am. This presentation will focus on the geological causes, engineering design, and construction aspects involved in stabilization of large, slow moving landslides located in both the Blue Ridge and Piedmont physiographic provinces of the Carolinas. Three projects designed and constructed since 2006 will be featured and contrasted. Following a discussion of the geological aspects and root causes of each slide, the primary focus will be to compare and contrast different design and construction methodologies employed in remediation of slides of this type. Comparisons will also be made between the design assumptions and the actual performance of the repairs, allowing for a discussion on how such designs may be refined in the future. Mr. Doug Chappell of Wurster Engineering & Construction, Inc.
Doug Chappell currently serves as vice president Wurster Engineering & Construction, Inc. Mr. Chappell has a degree in mining engineering from the University of Missouri at Rolla. Prior to working with Wurster he worked as an engineer in mines in North and South America, as well as serving as engineering manager for a regional geotechnical consulting firm. Mr. Chappell is currently responsible for engineering and project management for Wurster and has designed and managed hundreds of Geotechnical construction and ground improvement projects in the southeast. Mr. Chappell is a registered engineer in South Carolina. Wurster Engineering & Construction, Inc. (WEC) is a specialty geotechnical contractor serving the Carolinas, Georgia, Tennessee, and other portions of the Southeast. Based in Greenville, South Carolina, WEC is employee owned and operated by licensed professional engineers and construction professionals. WEC’s primary areas of expertise include ground improvement, landslide repair; soil nails walls; and deep foundations including micropiles, auger cast piles and helical piers. Please join us for our annual golf tournament on Friday, June 16 which benefits the ASCE Southern Branch Scholarship and Student Assistance Fund. The tournament will be held at the Highland Creek Golf Club. Please see the flyer for additional information about the tournament including costs, registration, and sponsorships. Payment: For event payment, click here. Sponsorships: Hole Sponsor ($200), click here. Putting Green Sponsor ($200), click here. Beverage Cart Sponsor ($300), click here. If you have any questions, please contact Justin Glatzer at Aerotek. This year's ASCE NC Spring Tech is scheduled for Friday, April 28, 2017. 101 Science Drive in Durham, NC 27705. It is a one day event and offer up to 6 PDHs. Stay tuned for registration information. Please join us for a joint ASCE/PENC dinner meeting at Dilworth Neighborhood Grille on Monday, April 10, 2017, with registration/socialization beginning at 5:30 PM. This presentation will provide an update on licensure enforcement, discuss the Board’s handling of non-licensed practice, and cover the Rules of Professional Conduct. David joined the staff of the North Carolina Board of Examiners for Engineers and Surveyors in 1998. As the Board’s Assistant Executive Director he supervises investigations of engineers, surveyors and corporations as well as non-licensed practice. David also oversees business licensure and compliance; continuing professional competency; license renewals; and the Board’s regular program of enforcement and education. David previously conducted criminal investigations in the U.S. Army as a Military Police Investigator. He is a past Chairman of the Committee on Law Enforcement for the National Council of Examiners for Engineering and Surveying. David has a B.A. in History and Social Science from Eastern Connecticut State University. Payment: Unfortunately, we will not be able to accommodate PayPal use for this meeting. Please plan on bringing cash or check to pay when signing in at the meeting. Credit cards will not be accepted. We are looking for volunteers for our Spring Stream Clean-Up event on Saturday, April 8. ASCE Southern Branch has adopted a portion of Little Sugar Creek between East Boulevard (Freedom Park) and E. Morehead Street. This also includes the adjacent greenway. Since this is a stream clean-up, please be prepared to actually get into the creek. While you shouldn’t get wet, please plan to bring clothes that can get a little dirty. We have plenty of gloves and trash bags for everyone, but only have a limited number of hip waders and litter grabbers that we will provide. Not everyone needs to get into the water as the greenway needs clean-up as well. This is a great experience and you will be helping keep our streams and greenways clean and beautiful for everyone to enjoy. This is a great way for some of your kids to get some community service hours! Children are welcome to join, too, with an accompanying adult. Enter Freedom Park from East Boulevard. We will be meeting at the first parking area on the right. If you’d like to volunteer, please contact Luis Campos. Conference details, registration, and more information to follow. Please join us for our March Meeting. This will be a lunch meeting at The Liberty on Thursday March 16, 2017, with registration/socialization beginning at 11:30 am. Recent rainfall events in North and South Carolina have brought a renewed scrutiny to regional infrastructure issues. In particular, hydraulic performance of dam spillways and other hydraulic structures have been pushed beyond their limits. The presentation will review infrastructure data related to dams and present historical elements that provide the background for a discussion of current spillway performance. The presentation will review spillway examples and identify elements of spillway design that are critical to hydraulic performance. Mr. John Garner, PE of Bunnell-Lammons Engineering, Inc.
John F. Garner, PE, M.ASCE serves as Lead Design Engineer for Bunnell-Lammons Engineering in their Asheville, North Carolina Office. For the past 19 years he has practiced in Dam Engineering providing consulting and engineering/construction support services on more than 100 dam projects throughout the Southeastern US. A graduate of Clemson University, John’s training and background is focused on hydrologic analyses and hydraulic design of spillway structures for small dams. His professional experience has exposed him to all phases of dam operations, inspections, investigations, remediation design, construction management, and emergency action planning. Please join us for our February Meeting. This will be a lunch meeting at Dilworth Neighborhood Grille on Thursday February 16, 2017, with registration/socialization beginning at 11:30 am. This presentation will outline the different Drone types, Drone usage, their reliability and mapping accuracy, and FAA regulations, and any questions you may have about current practices. Mr. David Boyles of LDSI, Inc.
David Boyles is the founder of LDSI, Inc. and is licensed as a PE in North Carolina and as a PLS in North and South Carolina. He has a BSCE from Auburn University (1975) and a GIS Certificate from UNCC (2003). He is a member of ASCE, NSPS and NC & SC Society of Surveyors. LDSI, Inc. is a Service Disabled Veteran Owned Small Business providing quality services in land surveying; geographic information systems and sub-surface utility engineering. Their client base includes private contractors, developers, engineers and architects; federal, state and municipal governments. Their original emphasis was on engineering surveys and photogrammetric control. LDSI, Inc. maintains licensure in North Carolina, South Carolina, Tennessee and Virginia. Please select either the member or non-member registration price by clicking on one of the three links above. The link will direct you to a payment page, at which time please select the number of registrations you would like to pay for (if you are registering more than one person). Then, either log in with your PayPal account to check out, or click on the “Don’t have a PayPal account” tab to open a credit card payment window. Once your payment information is entered, on the next screen please indicate that you would like to include specific instructions for your purchase and include the names of the people you are registering. This will ensure that we have an attendance list of everyone planning to attend. Please note – refunds will not be available to anyone that does not attend the meeting and does not request a refund at least 24 hours before the meeting date. Please contact Robert Price rprice@summit-companies.com with any questions regarding paying for your registration on the AEG Carolinas Website via PayPal. Please join us for a joint ASCE/AEG Dinner at Draught Restaurant and Bar on Thursday January 19, 2017 at 5:30 PM. Please see the attachment for more information regarding this joint meeting with The Carolinas Chapter of the Association of Environmental & Engineering Geologists (AEG). Soil drying, modification and stabilization incorporate different methods for altering the properties of soil to enhance its physical properties and engineering performance. Soil stabilization is utilized for a range of engineering tasks, the most well-known application being in the road construction and airfield pavements, where the primary goals are to dry the soil, improve the soil engineering properties and to lessen the development cost by making best utilization of locally accessible materials. In addition to improving strength, stabilization can provide erosion control, pH adjustment, and permeability reduction. This presentation will outline the many benefits of utilizing chemicals, such as lime and cement, in soil and explain how they are achieved. It will provide guidance on when chemical modification makes sense technically and financially and how to select the right chemical for a job. Additionally, it will touch on applicable laboratory testing methodologies and field practices for incorporating these chemical into the soil. Dale Andrews earned his Master’s Degree in Engineering Geology from Kent State, Ohio and is a registered Geologist in the state of Pennsylvania. Dale began his technical career as a geotechnical consultant and project manager within the transportation group of Gannett Fleming, a dynamic infrastructure solution and construction management service focused firm. After nearly a decade with Gannett Fleming, Dale accepted an offer to work for Carmeuse Lime & Stone. Carmeuse is a global leader in the production of lime and limestone, producing up to 7 million tons of lime, 12 million tons of high quality chemical grade limestone, and 15 million tons of quality aggregates per year in North America alone. Dale is currently Carmeuse’s lead technical advisor and R&D manager for all of their construction and stabilization/solidification opportunities as well as their entire milled products’ portfolio. Collectively, Dale has nearly twenty years of experience in chemical stabilization of soil, solidification of waste, construction aggregate and filler applications, dredged material remediation, slope instability mitigation, foundation design, erosion control, landfill management and construction testing. PayPal-ASCE/AEG Dinner at Draught Restaurant and Bar: For registration, click here. If paying at the door, please bring cash or check with you. For PayPal registration and payment, please note – refunds will not be available to anyone that does not attend the meeting and does not request a refund at least 24 hours before the meeting date. Please contact Robert Price rprice@summit-companies.com with any questions regarding paying for your registration on the AEG Carolinas Website via PayPal. Please join us for our June lunch meeting on Thursday, June 16th. Attendees will receive 1 PDH for attending, and lunch will be provided. Also make notice of the change in the meeting location. We feel that we have outgrown the capacity at The Liberty resulting in a crowded atmosphere and having to turn away last minute RSVP’s. We hope that the private room at the Dilworth Grille will provide an excellent environment for Charlotte area civil engineers to meet, network, and obtain professional development for licensure. Thank you for your continued support of the ASCE Southern Branch and hopefully the new location will allow room to grow, so please invite your coworkers and fellow engineers. Dr. Pulugurtha has over 23 years of experience conducting research on a wide range of topics related to transportation planning / modeling, alternate modes of transportation (includes transit and pedestrians), traffic operations and safety, risk assessment, GIS and Internet mapping applications, quantitative analysis, and the application of emerging technologies. He has published actively and won international awards for his technical papers. He has served as a PI or co-PI on 70 grants and sponsored research projects. These projects were sponsored by federal, state, regional and local agencies, private sector and non-profit organizations. He is a member of ASCE, TRB and ITE. He currently chairs the ASCE T&DI Planning, Economics and Finance Committee. Please note – refunds will not be available to anyone that does not attend the meeting and does not request a refund at least 24 hours before the meeting date. Please contact Allison Drake Allison.Drake@rsandh.com with any questions regarding paying for your registration via PayPal. Spring is Here so Start Hitting the Driving Range to get ready for the 31st Annual ASCE Southern Branch Golf Tournament. This year the tournament will be held at The Golf Club at Ballantyne Hotel www.theballantynehotel.com/golf on Thursday May 19th, 2016 with a shotgun start beginning at 8:30 AM. Registration fee is $90 per person which includes green fee, cart fee, range balls, lunch and beverages. Prizes will be given out for the following contests to include Low Gross and Low Net Scores, Closest to the Pin, and Longest Drive. Email or Call Justin Glatzer (704-329-8166 or jglatzer@aerotek.com) with any questions, and if your interested in corporate sponsorship opportunities. We look forward to having everybody out for a great game of golf and thank you in advance for your participation and support of The ASCE Southern Branch and the UNCC Scholarship Fund. Replacement of approximately 9300 original wood seats with new plastic bucket seating. (approximately 8650) to provide additional seating comfort – with new seat widths of 18” to 21” compared to previous widths of 17” to 18”. New state of the art Daktronics center-hung scoreboard and ancillary ribbon boards. New center scoreboard features HD quality full screen video complemented by HD quality side/corner video boards. New sound system replacing previous end-zone public address system delivering distributed sound and concert quality audio. Replaced 1993-era metal halides sports lighting with new Cree LED sports lighting fixtures – enabled the venue to increase foot-candle readings from approximately 130 to 230 foot-candles. The new lighting also allows for instant off/on controls that is a must-have for in-event features, videos, etc. Upgraded all event/team dressing rooms with new flooring, lighting, ceilings, and wall treatments to enhance usability for events. Gutted a former office/staff area of approximately 3,300SF to build a new hockey locker room complete with coaches office, work-out space, equipment room, changing room, main dressing space, medical/training room, commercial laundry space along with showers, sinks and toilet areas. Upgraded on exterior and interior all concession points of sale including new counters, walls and upgrades to plumbing and electrical. Additional equipment (some new, some relocated), signage and graphic packages have enabled our food and beverage operations to serve our customers at elevated levels for all events. Complete renovation of former dining/hospitality area that increase square footage, upgrades to kitchen, new seating, upgrades to existing bar and additional new bar and major upgrades to lighting and aesthetics. The crowning touch of this space upfit was walkway through the area for hockey team players/coaches directly to the ice from their adjacent dressing room – providing fans of all ages a chance to be up close and personal as the players enter/exit the ice. 2003-2007 – returned to Charlotte Coliseum (Tyvola Road) to prepare staff for move to new Time Warner Cable Arena and be onsite for final phase of construction of Time warner cable Arena (then knows as Bobcats Arena). 2007-2013 – served as onsite construction liaison for CRVA during construction of NASCAR Hall of Fame. 2013-present – returned to the complex on Independence Boulevard now known as Bojangles Coliseum/Ovens Auditorium as General Manager. Steve Bagwell-VP of Venues and Charlotte Convention Center Director for the Charlotte Regional Visitors Authority (CRVA). Mr. Bagwell is a veteran of the organization for more than 20 years, Bagwell first began his career as warehouse manager when the Charlotte Convention Center opened in 1995. He’s risen through the ranks taking on several roles that have led to his current position as VP of Venues. Some of the high points of Bagwell’s career range from achieving his CPA designation in 2000 to managing a multitude of needs at the Charlotte Convention Center during the eventful 2012 Democratic National Convention. Please join us for the Joint ASCE/PENC Dinner at Legion Brewing (www.legionbrewing.com) next Monday April 11, 2016. Keep in mind this dinner is a joint meeting with the PENC Charlotte Chapter and we hope that we will also see you at our ASCE Lunch Meeting scheduled Thursday April 21 at the Bojangles Coliseum. See the attached email for the ASCE Lunch Meeting at Bojangles Coliseum for additional information and RSVP/PayPal links. We’ll hear about all the renovations to the former Brodt Music Company’s building into a hip new brewing pub in Plaza Midwood by fellow Civil Engineer and Legion Brewing Owner, Phil Buchy. In addition to the construction details, we’ll also get a course in the brewing process-everything from mashing, lautering, sparging, boiling, isomerization, hop additions, knockouts, fermentation, and yeast management. Whew! It’ll be a lot of information to digest. own and managed the construction of Olde Mecklenburg Brewery’s new space and helped the Unknown Brewing Company prior to it’s opening. A homebrewer for more than twenty years, Phil brings his affinity for construction and obsession for brewing together into a successful new business Legion Brewing. Cost: $25 members, $30 nonmembers - includes pizza dinner and your choice of one of Legion’s brews. PayPal-ASCE/PENC Dinner at Legion Brewing: For member registration, click here. The UNC Charlotte ASCE Student Chapter will be attending the 2016 Carolinas Conference in Greensboro, North Carolina on the campus of North Carolina A&T State University. The Conference runs from Thursday March 31 through Saturday April 2, 2016 and is great opportunity for the next generation of civil engineers to learn and participate in competitions with other student chapters. The UNCC Student Chapter will be participating in the Concrete Canoe and Steel Bridge Competitions and would appreciate your support if you are able to attend. The Concrete Canoe Competition will be on Friday April 1, 2016 (9am – 12pm) at Lake Townsend. The Steel Bridge Competition will be on Saturday April 2, 2016 (8am) at the NC A&T Corbett Gymnasium. ASCE and the UNCC Student Chapter Thanks You for your continued support. The Region 4 Assembly, which includes all members of the American Society of Civil Engineers (ASCE) in the states of Arkansas, Indiana, Kentucky, North Carolina, South Carolina, Tennessee, Virginia, and West Virginia, sponsors an annual competition and award for a Younger Member who resides within Region 4. A Younger Member is defined as a member, associate member, or affiliate not over 35 years of age on February 1, 2016. If one chooses to enter the Daniel V. Terrell competition, the paper must be submitted to the Terrell Committee, by the entrant's Section President, by March 1, 2016. Two (2) papers per Section may be entered in the Daniel V. Terrell Paper Competition. The entrant must then present their paper during the Spring 2016 Meeting of the Region 4 Assembly to be held on April 15 &16, 2016. Travel Stipends to attend the Spring 2016 Region 4 Assembly may be available from the entrant's Section and/or Branch. Prizes available for the top two papers: First Places gets the Terrell Plaque and $500 cash, Second Place gets $250 cash. "When working in a foreign location, what defines the design standard which the engineer can rely on to have met his or her ethical obligation to provide a safe and sound engineering solution or design?" Please join us for our December lunch meeting on Thursday, December 10th. Attendees will receive 1 PDH for attending, and lunch will be provided. Presenter: Mr. Ben Taylor, P.E. Ben will be presenting the "Trade Street Widening Project" currently under construction for the Town of Matthews. This heavily congested corridor will benefit from added travel lanes, bike lanes, and sidewalks. The presentation will discuss the traffic planning, roadway design, and construction. The presentation will also include the future crossing of Four Mile Creek. Ben Taylor has been a Project Manager for Kimley-Horn and Associates for over a decade. Before that, he worked at NYSDOT for 7 years. Throughout his career, Ben has led transportation-focused projects including roadway widenings, roadway re-alignments, intersection reconfigurations, interchange reconfigurations, bridge replacements, and greenway projects in NC, SC, and GA. He is a registered Professional Engineer in NC and GA. Please go to our NEWS PAGE for event information! Please join us for our October membership meeting. Check out our NEWS PAGE for more information! Save the date! The 2015 Spring Technical Conference will be held at the NC A&T Alumni-Foundation Event Center at 200 North Benbow Road, Greensboro, NC on April 29, 2015. More information on registration and technical agenda will follow soon. Topic: StormTank Module and StormTank Pack – A new and innovative subsurface storm water storage system. Mr. Faircloth is a regional sales manager for Brentwood Industries, headquartered in Reading, Pennsylvania. Mr. Faircloth is a Georgia native and graduate of Davidson College. He has spent the last 30 years of his professional career in the commercial real estate and construction industries, and currently resides in York, Pennsylvania. He is responsible for his company’s storm water products sales in Maryland, Virginia, and the Carolinas. Dr. Daniels currently serves as Professor and Chair of the Department of Civil and Environmental Engineering at UNC Charlotte. He also chairs the National Ash Management Advisory Board for Duke Energy. While at UNC Charlotte, Dr. Daniels has led numerical, laboratory, and field-based projects for utilities and consultants, as well as state, national, and foreign agencies. Much of this work has focused on physical and chemical controls on soils and industrial byproducts, with a focus on coal fly ash. His laboratory participated in the validation testing as part of the approval process for the U.S. Environmental Protection Agency (EPA) Method 1314, one of the latest methodologies for evaluating the leaching potential of coal fly ash. His work with organo-silanes to render soil and ash hydrophobic has been recognized as a potential method for reducing infiltration and leachability, as cited in the U.S. EPA’s proposed rule on Coal Combustion Residuals. Visitor parking is available in the CRI garage, located behind the EPIC building on Robert D. Snyder Road. Parking validation will not be provided. Please RSVP by noon to let us know in advance if you can attend the meeting by clicking to the RSVP link presented in this e-mail. Please note – refunds will not be available to anyone that does not attend the meeting and does not request a refund at least 24 hours before the meeting date. Please contact Allison Drake at Allison.Drake@rsandh.com with any questions regarding paying for your registration via PayPal. Please join us for a joint lunch meeting with the SC Section’s Catawba Branch on Thursday, January 29th. This meeting will include a lunch presentation on Carowinds’ new Fury 325 Roller Coaster, followed by an optional walking tour of the construction site. Please note that if you would like to participate in the site tour after lunch, you will be on an active construction site – Each person in attendance will be responsible for providing their own hard hat. Also, the tour will be conducted outdoors, so please dress accordingly for winter weather. Additional information on the coaster can be found here. If you are paying at the door, please provide either cash or check payment. If you would like to pay via PayPal, please click on the appropriate link below. For student registration, click here.